The world is a weird place. One of the largest retailers in the world is quite anti-gun but has a massive selection of gun parts and accessories. Any guess to what retailer it is? My Photoshop skillz are impressive, no? However, outside of things related to ‘assault weapons,’ the market is quite extensive when it comes to gun gear on Amazon. They sell holsters, flashlights, slings, sights, scopes, and more. In the deepest and darkest corners of Amazon, you can stumble across some very odd gun gear and accessories. Some appear to be strange, but some are quite brilliant. We’ve gathered four such pieces of gun gear from the deepest and darkest corners of Amazon, and we bought them and used them. Are they brilliant pieces of equipment? Or absolute pieces of trash? I got to pick my favorite weird pieces of gear and have had a fun time reviewing each one. So let’s kick it off! This is a deceptive piece of gear, and on Amazon, it has a low 2.5 stars from 3 reviews. Your expectations may be low, but in my experience, the score isn’t reflective of its quality. The AmmoPal is a magazine, but it doesn’t go into a gun. The AmmoPal functions just like a magazine and is complete with a rectangular body, large follower, and spring to propel ammo to the top. The AmmoPal is a 12 gauge Pez dispenser essentially. It’s designed to hold ammunition in an organized way that allows the shooter to feed their tube fed weapon easily. One of the difficulties in using a shotgun is carrying extra ammo. There are lots of options, including pouches, bandoliers, and even those little 3-Gun shotshell caddies. They all have their issues, especially if you are tactically using the shotgun. The AmmoPal allows you to carry ammunition on a vest or belt and to be intuitive when it comes to reloading the shotgun. 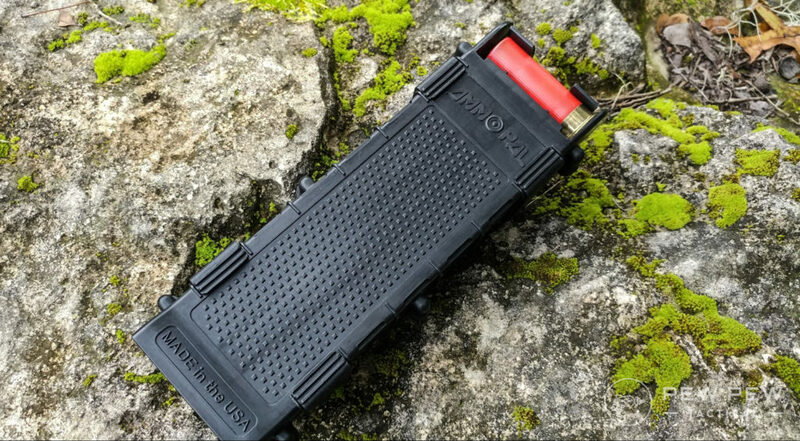 The AmmoPal has a series of clips on it that allows you to mount it to MOLLE or PALS webbing. The device can be easily stored in a AR 15 double mag pouch for convenient carry. The device holds ten 2.75-inch 12 gauge shells and is quite well designed. The AmmoPal has two teeth at the top that catch the rounds and hold them in place. Between the teeth is a small section that is designed to let the user press the rounds forward and out of the AmmoPal. Pulling shells from the AmmoPal is easy and quick. It’s intuitive and ergonomic in its design. Retrieving the shells to shove in your gun is easy, and the AmmoPal holds the ammo secure. Better yet it holds the ammo in the same location every time. With a pouch or bandoleer, you have to move your hands to find ammo as you dispense it. The AmmoPal allows you to build muscle memory with ease since the ammo is in the same place for every reload. 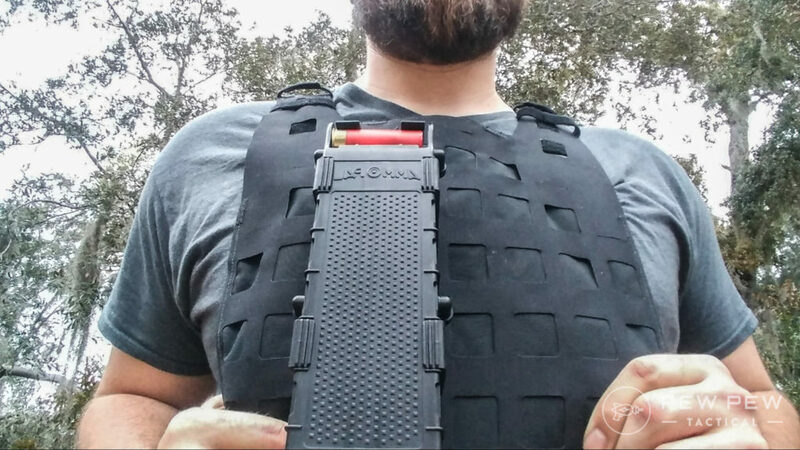 The size of the AmmoPal allows you to store three of them across the torso of a standard plate carrier. This gives you thirty rounds of ammo, and best of all will enable you to utilize the versatility of the shotgun. One can be standard 00 buckshot, the next can be slugs, and the final can be Federal flight control or reduced recoil number 4 for special purposes. I found the best way to use the device is with a side saddle equipped shotgun. You feed the gun from the side saddle, but you supply the side saddle from the AmmoPal. The side saddle is always faster in a pinch, and the AmmoPal makes reloading the side saddle more convenient and more accessible. Of course, feeding the gun from the AmmoPal isn’t much slower. The device works as intended and can be mounted in a couple of different ways. I’d love a way to mount the AmmoPal horizontally on a belt. Outside of tactical use, it would be a very convenient way to carry ammo when shooting clays, bird hunting, or small game hunting. This is especially true for single shot and double barrel guns. This is a cool device, and as a shotgunner, it has captured my heart. See our recs for the Best Shotgun Ammo for Range & Home-Defense to fill up your AmmoPals. Two types of people in the gun world annoy me, people, who use the world clip to describe magazine and people who lose their minds when people call magazines clips. They both occupy a special place in my pet peeve list. With that in mind, the naming of Recover Tactical’s Magazine Clips is absolutely genius. For one it is 100% accurate. These are clips that attach to your magazine. You know the clip that’s on a pen, that holds it to your shirt? Imagine that on a magazine, specifically a pistol magazine. 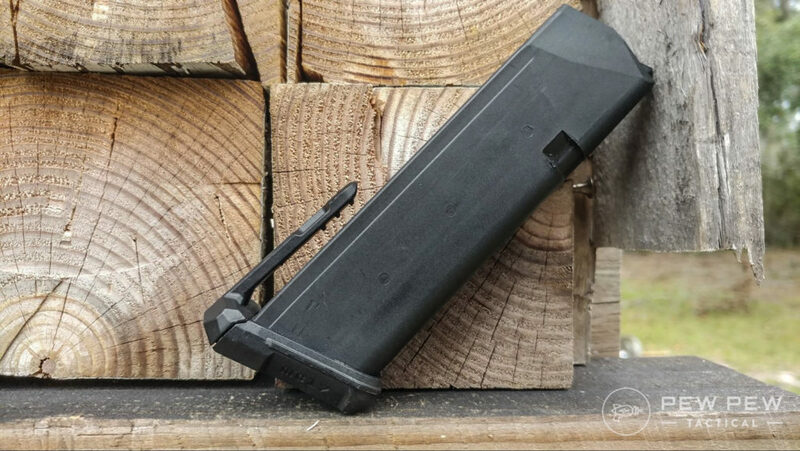 A clip that attaches to the baseplate of your magazine that helps you position the magazine for both easy carry and quick reloads. If you want to carry a reload, but don’t have the desire for a magazine pouch, then the Magazine Clips are for you. You use them you have to swap baseplates, and the Recover Tactical baseplates are very nice. They are a little longer and a bit wider which makes it easier to get a grip on them while you reload. The clip mentioned above attaches to the bottom of the baseplate and attaches and detaches with ease. 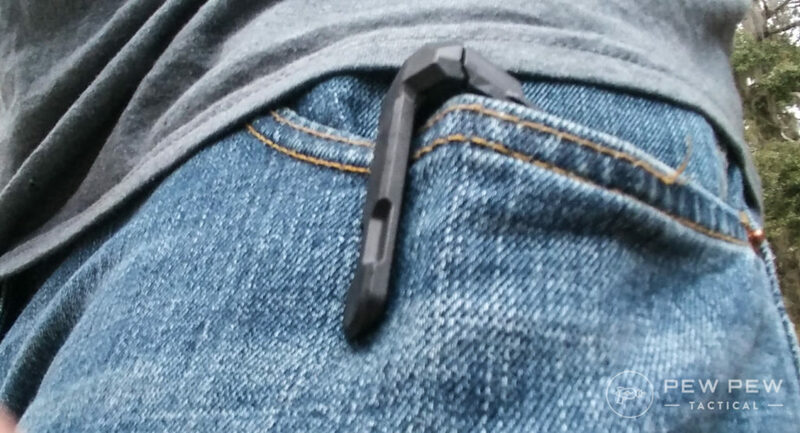 When positioned in the pocket the clip goes outside of the pants pocket and keeps the magazine in a position that is easy to access. This makes it easier to draw and reload than just stashing one in your pocket. 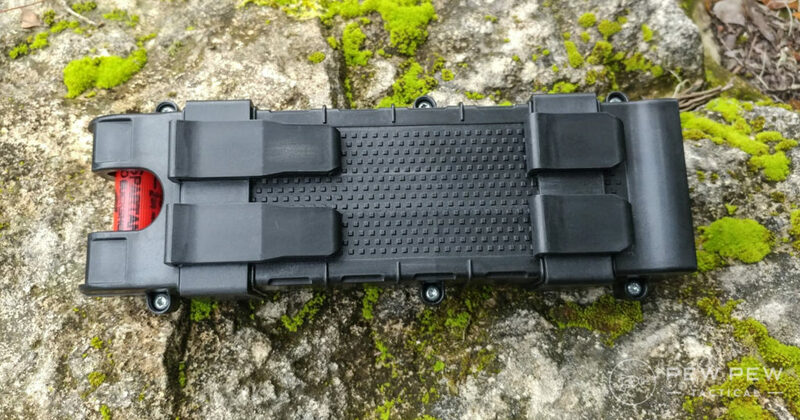 The clips can even thread through MOLLE webbing and hold themselves secure. 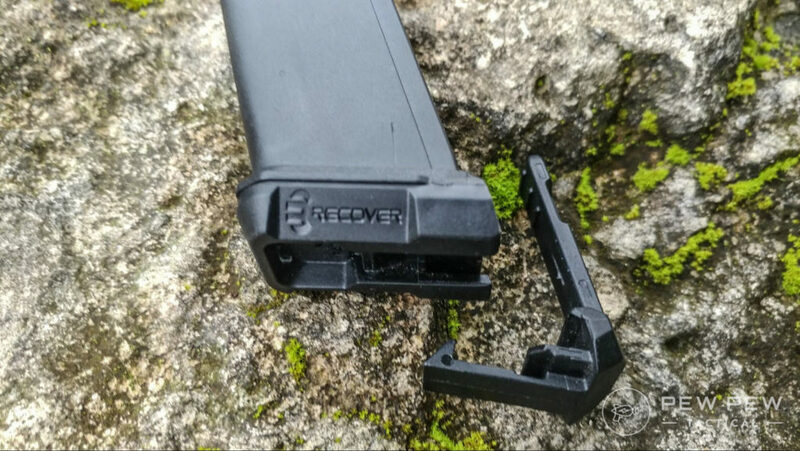 The Recover Tactical Magazine Clips are easy to install and easy to use. Best of all they are very affordable, and the price point makes them attractive. Drawing one takes time and practice to master, and it’s a little harder than a standard magazine pouch. However, it’s much easier to conceal and lot more convenient than a magazine pouch. The technique needed to reload takes a little time, and it’s not super friendly to skinny jeans enthusiasts. It requires a pinch, then a pull, and then into your standard reload. This isn’t terribly slow, but you wouldn’t take to an IPSC competition. They make them for a variety of guns including the Glock 17, 19, and 21, as well as the S&W Shield and a few others. The downside is if you go Glock and have a pistol caliber carbine that houses the magazine in the pistol grip the clips have to be removed. Not a serious issue since it takes about 3 seconds or so to remove the clip and keep gunning. 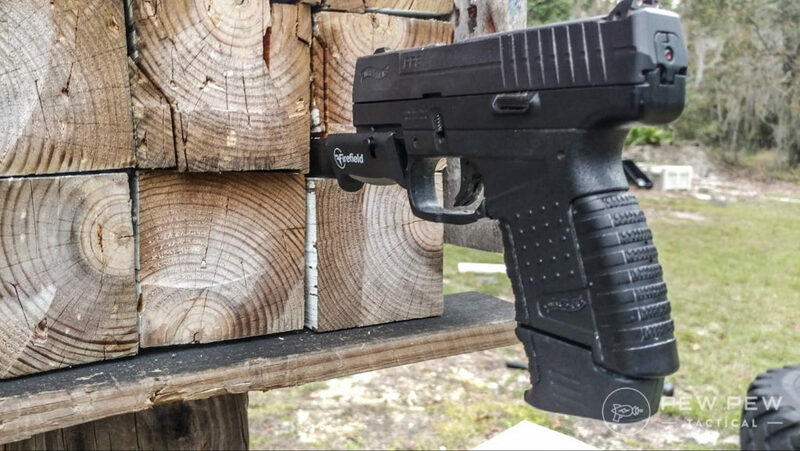 The Recover Tactical Magazine Clips are a simple, affordable addition to your handgun. Honestly, they are a great all-around gift idea for your fellow Glock enthusiast. It’s hard to beat something so robust, so simple and so useful. If it’s not for you…we have our roundup of Best Aftermarket Glock Magazines too. This is where I, and likely many of you first heard of Recover Tactical. 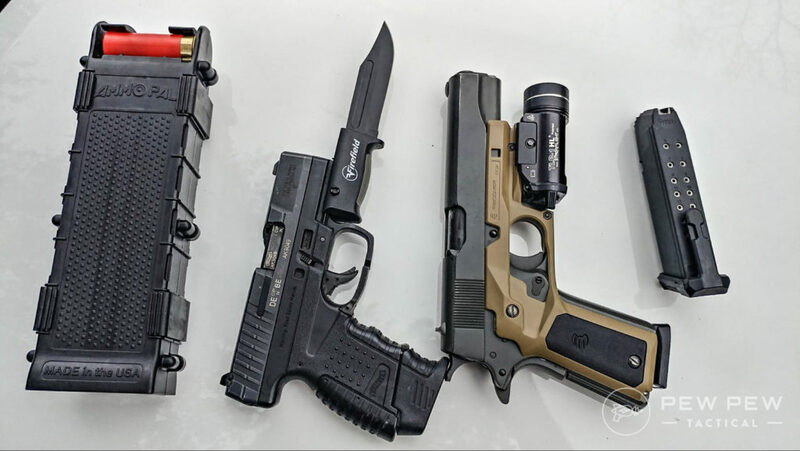 These grips hit the market and became a bit of a meme. I was wondering myself what exactly was the point? They seemed gimmicky and cheesy, but then the positive reviews rolled in, and Recover Tactical kept up the support of the grips. They upgraded them as necessary and have refined the design. They are a complete two-piece grip system that attaches to guns than lack a rail. 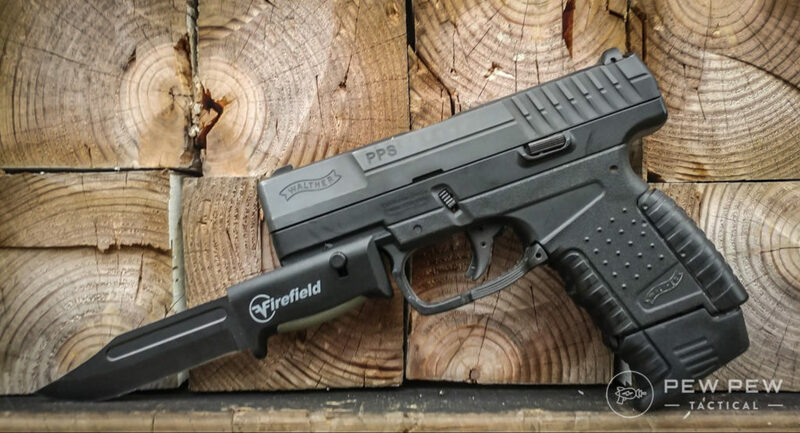 They add a rail to the system by connecting at the grips and cover over the trigger guard and under the dustcover. This allows you to add a rail to basic 1911s, as well as Beretta 92s. They ever make rails for Gen 2 Glocks, as well as uber compact guns like the Glock 43. Although the 1911 and Beretta 92 are the only models that are grips and rails. My set is the newer CC3P grips that come with interchangeable grip panels. 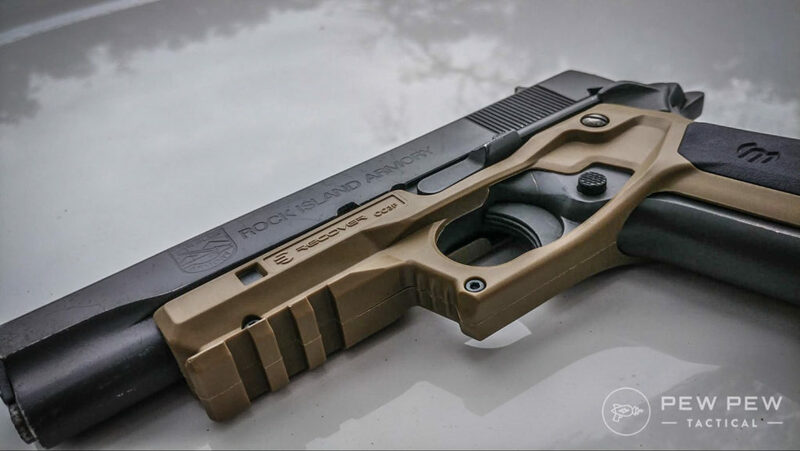 The grips come with both FDE and Black grip inserts. I like the look of the black and FDE on my el cheapo Rock Island Armory 1911. The grips are inherently quite comfortable and to me feel very good in the hand. They are thin and don’t compromise the thin grip the 1911 has. They are also cut perfectly for both standard and ambi-safeties. They attach at two points at the grip, one in front of the trigger guard, and one near the very end of the rail. Once connected they are very stable and round after round they stayed put. No function or operation of the gun is interrupted in any way from these grips. Their purpose is simple, but what’s the point? A long time ago the 1911 you see here was the only handgun I had for self-defense. I only had it because I received it as a gift and as a young Marine the cash wasn’t there for a new handgun. I believe that any home defense gun needs a white light, and I didn’t have the means to attach one. The Recover Tactical Grips give you the ability to mount a weapon mounted light instead fo being forced to utilize a handheld light. 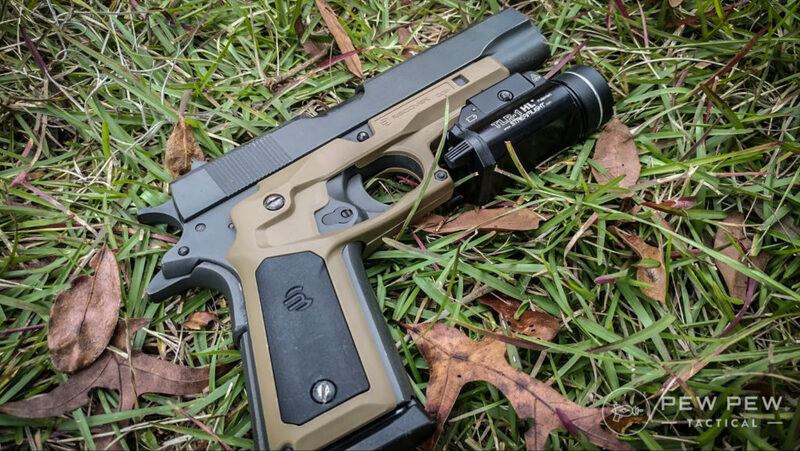 The CC3P grips a simple addition that takes an old gun and makes it a modern lead slinger. The grips are simple, affordable, and they work as advertised. Best of all Recover Tactical even produces a holster to accommodate a weapon with the grips and any light you need it to. This is an excellent option for a home defense gun, and to bring a weapon into the modern day inexpensively. Need a light? 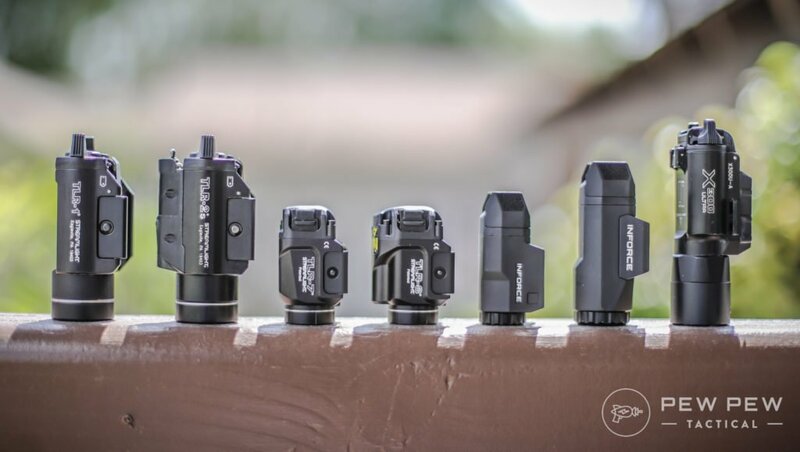 Check out our Best Pistol Lights article. Nope, I bought one, laid down my twenty bucks with exactly zero expectations, and I was still disappointed. I mean its a pistol bayonet so it’s already useless by design. However useless stuff can still be well built or have some kind of redeeming value. 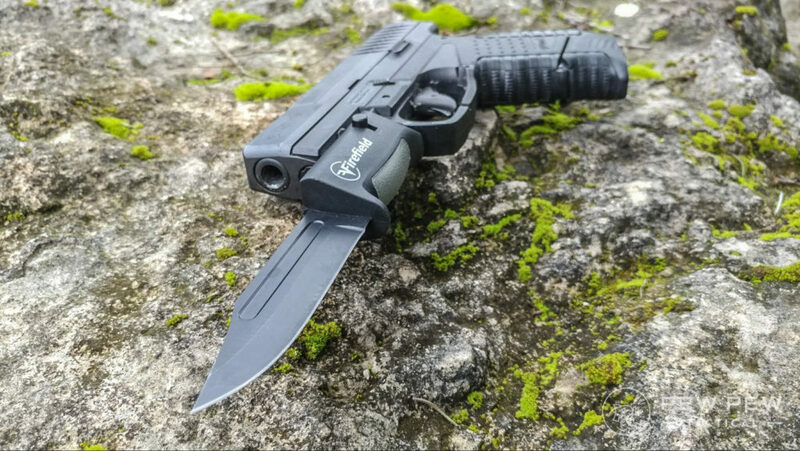 The Firefield Pistol bayonet does nothing right. Let’s talk use and intention first. It’s a novelty item, something I’d post on Reddit for invisible internet points. The companies making these items sell them as a last-ditch self-defense tool if you run out of ammo. However, there isn’t a holster company in the world making a holster that will accommodate a handgun equipped with a bayonet. That means you have to attach the bayonet once you run out of ammo. If you have room to carry a pistol bayonet you have room for a spare magazine. If you have time to stop and attach a bayonet you have time to escape. If your back is indeed against a wall, a pocket knife would be a better tool for self-defense than this. It’s inherently useless unless you are Christian Bale in Equilibrium. Now it can be used as just a knife, but its a terrible knife. The handle is cheap plastic, and the words “full tang” are miles away from this. The blade is dull and made from a steel so crappy Firefield doesn’t even list what it is. In direct contrast to their warnings, it’s not very sharp, or even very pointy. It attaches and detaches via a small button, but the portion that holds the bayonet onto the rail is a super small piece of metal that looks like it’ll shear after the first significant blow. It’s also a major hassle to attach to a gun. The section cut for a rail isn’t cut to spec, and it’s too tight. You have to force the knife onto most rails with force. It won’t even attach to some guns because it’s too narrow. What the best use for this thing? A novelty gift maybe? A great White Elephant gift for your gun buddies Christmas party perhaps. It’s worth a laugh, but nothing more than that. Want some actual good knives? Check out our Best Tactical Knives and Best EDC Knives. I’d hate to say I spend a lot of time searching Amazon for gun stuff. From Plano boxes to optics the joy of two-day shipping is one that’s hard to avoid. 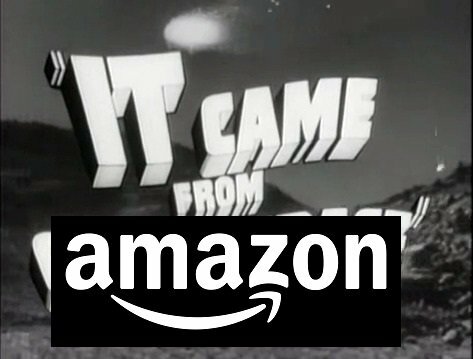 Amazon offers a lot of gun stuff, especially when it comes to the odd and unusual. Here is just a small sample of the items Amazon has to offer when it comes to gun stuff. This may be a series we do here so let us know what you think. Want to see more awesome and useful gear? Take a look at our Editor’s Picks! A fun article, and could definitely be a recurring one. The good news is they are cheap enough to take a risk. Come on! That bayonet, well OK, knife, looks super cool on my pistol caliber carbine! I have one with a sheath, and it looks great! And lets face it, it is almost as functional as my tactical toilet plunger I have attached to my 6 picatinny rails. You just never know! I like the idea of this being a regular article! I thought it was very informative and useful. For sure! We’re working on some more of these.